Sometimes it pays to stay up til 4:30 in the morning . 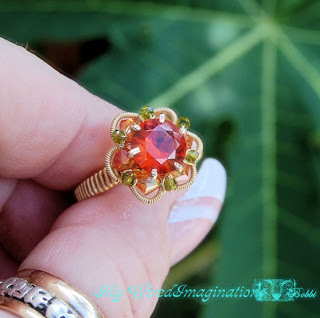 This is the ring from my tutorial Lesson in Patience Prong Ring Tutorial – dressed up with a variation of Perri’s (Shaktipaj) Periwinkle Bead Cap Tutorial . The design hit me after seeing an antique dinner ring in a nearby antique mall – (I will try to get a picture of it to post). 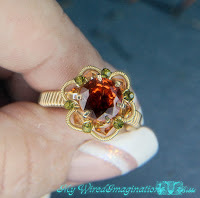 I used 28 and 30g GF wire, and 2mm and 4mm Swarovski Crystals. Still playing with the combination of Perri’s Periwinkle and my Lesson tutorials. 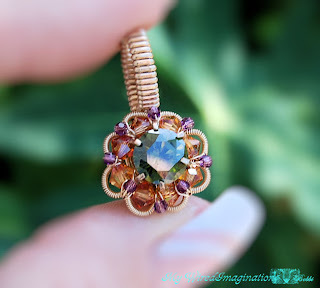 ~~In this pendant – the center stone is an 8mm faceted Olive Peridot CZ with 2mm and 4mm Swarovski crystals set in 14K GF wire. ← Story Teller Link Swap – The links So Far….